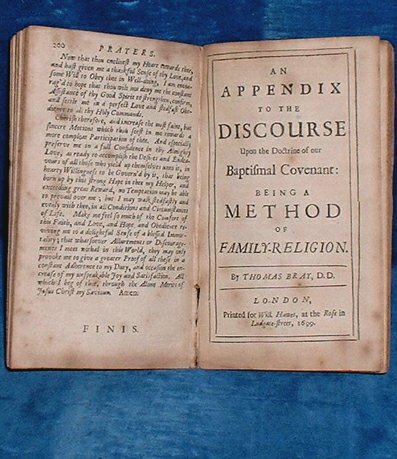 Title: A SHORT DISCOURSE Upon the Doctrine of our Baptismal Covenant; being an Exposition Upon the Preliminary Questions and Answers of our Church-Catechism .. [bound with] AN APPENDIX TO THE DISCOURSE Upon the Doctrine of our Baptismal Covenant: being a Method of Family-Religion. Description: London, Printed by E.Holt for Will. Hawes 3rd edition 1699 . Two Works in One Volume small octavo newer binding  +200pp and pp including music. Paper browned and small corners turned down or creased. Both works collate as in British Library copy except that the blank before titlepage has been replaced at a later date. End papers are new. *Bray was an influential English cleric & philanthropist, founder of the Society for Promoting Christian Knowledge in 1699. Sent by the Bishop of London to Maryland he founded parish libraries there, encouraged English clergy to visit or emigrate to America. The Dr.Bray Associates were instrumental in Georgia in the education of plantation slaves. This work was written for young people on the importance and meaning of Baptism into the church (WING B-4299 & B-4288).